Your 9th house became powerful on May 20 and is still powerful until June 21. The 9th House is considered the most fortunate of all the houses by the Hindu astrologers. Here in the west we consider it fortunate, but not necessarily the most fortunate. Power in the 9th house brings travel and travel opportunities, and also good opportunities for higher education. It's a very nice aspect for students at the college level, or who are applying for college. There is good news on that front. It is also fortunate for legal matters. When this house is powerful our Higher mind is activated. We are more in touch with it consciously or subconsciously. Thus it is time for religious and philosophical breakthroughs - many 'aha' moments will happen this month. The mental horizons expand, and when this happens, the whole life expands. When the 9th house is powerful we want more meaning in life. People become more interested in a good juicy theo­logical discussion than a night out on the town. The advent of a visiting guru or minister is often more exciting than that of a rock star. We discover the great pleasures in the mind under a powerful 9th house transit. In fact, you have been experiencing these things all year, but this month (and last month) more so than ever. On the 21st many important things happen. First, you enter a yearly career peak. The planets are at the 'highest', most elevated position in your Horoscope. There is much career progress happening and many good opportunities. New jobs or job offers are coming. 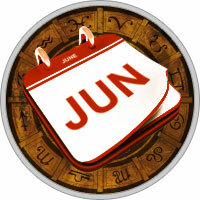 On the 27th Jupiter crosses the Mid-heaven and enters your 10th house of career. This adds to the success. It brings rises, promotions, honours and recognition and initiates a year-long cycle of career success and elevation. So focus on the career now. In the short term, all this success doesn't seem to help the finances - perhaps it even puts more stress on them. Sometimes career elevation requires outlays of money, for clothing, for new equipment, for memberships in the appro­priate organizations. The home might need upgrading too. Make all the investments necessary though it might be stressful. If you shift things around, you will find that you have the resources you need. A move could be happening now, or in the coming months. Health needs more watching after the 21st.